Individual researchers in India have until now managed to perform well, however they face a whole set of difficulties starting from time management, human resources, poor infrastructure and financial issues. Clinical investigators who accept to do research and continue clinical work find it very difficult to balance both fronts. Intense peer pressure felt by the surgeons, to succeed in respective clinical area, forces them to limit their time and interest for research. In other countries a triple helix structure with collaboration among institutions, industry and government exist, however hardly any such collaborations exist in India. The burden and responsibility of performing large scale clinically relevant and patient centered research comes to lie with the academic institutions. However the academic institutes too face the same issues as the individual researchers. We at IORG have recognized this issue and developed an unique model of a separate Academic Research Division (ARD) to help the institutes in their research work. Further details about ARD are provided below in FAQ format. What is an Academic Research Division (ARD)? An academic research division (Academic Research Division) will be a facility for performing in-house clinical trials. These are trials which have been designed by the surgeon keeping in mind the clinically relevant issues and will offer a path to improved patient care. The basic aims would be to apply and use research tools to generate evidence for providing best treatment for our patients. What does an ARD constitute of? Structure of an Academic Research Division– headed by an orthopedic clinical scientist who will be assisted by research coordinators. The head clinical scientist should be an orthopedic surgeon with special training in research front (and) and with understanding of the capabilities and limitations of basic science approaches and research methodology.Primarily the research co-ordinators may or may not be clinicians, but they should be science graduate with a diploma course in Clinical Research. The number of research coordinators may vary according to the volume of work at the institute. The Research Co-ordinator will be assisted by Data Entry Co-ordinators. The Data Entry Co-ordinators are the grass root workers of ARD and qualification of a science graduate with good hold on native languages is ideal for them. A bio-statistician is an integral part of this division and such a requirement should never be discounted. Lastly support of the clinical staff is most important for working of an ARD. What are the functions of ARD? -Conducting workshops and seminars on research methodology. With a good hospital information software and radiographic Picture Achieving, Compression and Storage System [PACS], the ARD will be well equipped to carry out all the above mentioned functions. The ARD can also co-ordinate with the administration in setting up inter- department or inter- institute studies. What will be required to set up an ARD? Financial support required for ARD. 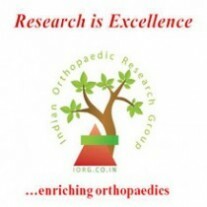 A financial agreement will be made between the institution and Indian Orthopaedic Research Group for Payment of Clinical Scientist and data Co-ordinators. Biostatistician will be required to be paid on project basis through the Ortho-Stat Service of IORG. How to apply for an ARD? The interested institutions should write to us at indian.ortho@gmail.com . One of the chief researchers will visit the centre and make detailed presentation regarding ARD and further discussion and decisions will be chalked out at the meeting. What are the terms and conditions of setting an ARD? The terms and conditions will be customized according to the need of the institution and the Orthopaedic department. These terms and conditions will be decided by discussion between IORG and the Institute and the Surgeons. How successful is the model of ARD? We have established and successfully run an ARD at Sancheti Institute for Orthopaedic and Rehabilitation at Pune since last one year. In one year a radiological and clinical database was created at the institute. More than 70 projects have been worked upon and more than 40 publications are already published including in Journals like JBJS, Journal of Orthopaedic Surgery (Hong Kong), Indian Journal of Orthopaedics etc. This has been an hugely successful venture and surprised us with amount of publications that can be produced from one centre in our country.